after page of thoughtful exercises and probing tools that will increase your skills. The four introspective skills you will learn are: Collaborative Intention, Truthfulness, Self-Accountability, and Self-Awareness and Awareness of Others. You also have to get what you need from the world around you. 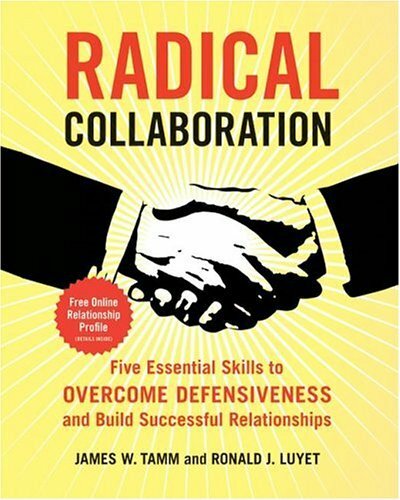 That's why Radical Collaboration teaches a critical fifth skill: Problem Solving and Negotiating. Tamm and Luyet teach you how to negotiate using the highly effective interest-based approach to problem solving. At the heart of the book is a theory of human relationships called Fundamental Interpersonal Relations Orientation, or FIRO. It explains how unmet emotional needs can sabotage our efforts to collaborate. How does the online profile work? When you get to chapter 7, you will be directed to a unique code number printed on a sticker on the inside back flap of this book. Take this number to the Web site for the book, www.radicalcollaboration.com . Here, you will be able to take a free relationship profile called the FIRO Element B. This profile will increase your awareness of how you behave in relationships and give you information about your behavior in three areas that strongly influences your ability to collaborate. The test will measure how important control is to you, how important it is for you to be included, and how comfortable you are being open about yourself. Are you are defensive and fearful? Is that preventing you from collaborating? Use the exercises in this book to identify your habits, and then learn how to moderate them. You will quickly become more effective at work and at home. Jill Alison Ganon is a writer and editor residing in Los Angeles.James W. Tamm is a former judge and an expert on dispute resolution and building collaborative relationships. He is currently managing director of the international consulting firm Business Consultants Network, Inc.
Ronald J. Luyet is a licensed psychotherapist who has advised Fortune 500 companies for more than thirty years. Ron is a vice president of consulting and training services for Business Consultants Network, Inc.